JENSEN, Benton Franklin, a Representative from Iowa; born in Marion, Linn County, Iowa, December 16, 1892; attended the rural and high schools; employed by a lumber company as yardman and assistant auditor 1914-1917; during the First World War served as a second lieutenant in 1918; manager of a lumber company 1919-1938; elected as a Republican to the Seventy-sixth and to the twelve succeeding Congresses (January 3, 1939-January 3, 1965); unsuccessful candidate for reelection in 1964 to the Eighty-ninth Congress; returned to Exira, Iowa; died in Washington, D.C., February 5, 1970; interment in Exira Cemetery, Exira, Iowa. Papers: 1938-1965, 12 feet. Includes correspondence, speeches, news releases, printed material, photographs, and memorabilia. Unpublished index in library. Papers: In the papers of Daniel Webster Turner, 1898-1969, 2.5 linear feet. Correspondents include Benton Franklin Jensen. Papers: In the papers of Charles Bernard Hoeven, 1937-1964, 28 linear feet. 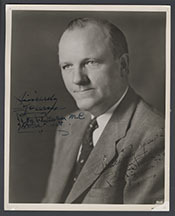 Collection includes campaign correspondence from Ben F. Jensen. Papers: In the papers of Milo Reno, 1927-1959, 3 linear feet. Correspondents include Benton Franklin Jensen. Papers: In the records of the Little Sioux Watershed, 1943-1975, .42 linear foot. Correspondents include Benton Franklin Jensen. Papers: In the papers of E. Howard Hill, 1923-2001, 8.22 linear feet. Correspondents include Benton Franklin Jensen. Papers: Letters in Grand Army of the Republic papers. Concern headstones, pensions, and Marshalltown Soldiers Home.